How much of the total solar eclipse will we see in Las Vegas? There have been a lot of stories and lists like " 15 best places to watch the total solar eclipse across the US ," but what exactly are we going to be able to see in Las Vegas on Aug. 21? Well, we aren't going to see the total solar eclipse. However, we will be able to see a partial eclipse and that is still pretty cool. 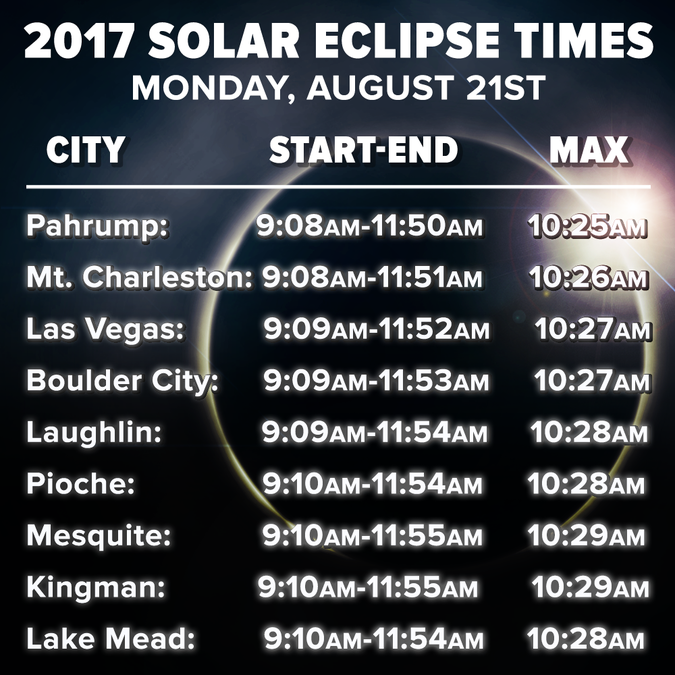 The eclipse will start at 9:09 a.m. in Las Vegas. The middle of the eclipse, which is when the most sun will be covered, will happen at 10:27 a.m. and the eclipse will end at 11:52 a.m. The sun will be 72 percent blocked during the middle of the eclipse. Hopefully, we'll have good weather for viewing the partial eclipse. August averages 22 clear days, 7 partly-cloudy days and 3 cloudy days (based on 1981-2010 climatology). However, it will still be monsoon season and anything can happen. The last time a total solar eclipse swept the whole width of the United States was in 1918. The eclipse on Aug. 21 will begin near Lincoln City, Oregon, and the path will be 60 to 70 miles wide. Totality will cross from Oregon into Idaho, Wyoming, Nebraska, Kansas, Missouri, Illinois, Kentucky, Tennessee, Georgia, North Carolina and, finally, South Carolina. (It will also pass over tiny slivers of Montana and Iowa.) The eclipse will last longest near Carbondale, Illinois: Approximately two minutes and 40 seconds. The biggest cities in the path include Nashville; Columbia and Charleston, South Carolina; Salem, Oregon; Casper, Wyoming; and (just barely) Kansas City, Missouri. Another total solar eclipse will take place in 2019. But, you'll have to be below the equator then to even catch a glimpse. So, you'll definitely want to be ready on Aug. 21. It might be the closest you ever get to a total solar eclipse. And don't forget that even though it will not be a total solar eclipse for Nevada, it is still important to wear eye protection during the event if you are planning on looking straight at the sun.